I'm coming up on my 1st Blogiversary, woo hoo! I have learned a great deal and had tons of fun over the past year. I have met so many cool people and made some great bloggy friends. And, I've managed to keep my sanity for another year, thanks to some much needed ME time. Stay tuned because I will be hosting a giveaway for my anniversary and will post about it 7 days out. Check back soon, or better yet, subscribe so you don't miss it! 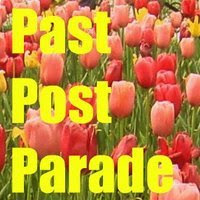 But for now, I'm taking a look back at some of my posts over the past year and participating in Elaine's Past Post Party over at The Miss Elaine-ous Life. If you'd like to party along, dig through your archives and link up! Here is a link to one of my favorite posts from the last year, another here, a favorite lesson here, a favorite video here, and a favorite pic here. There have been many great bloggy moments and some wonderful support from readers like you. Thank you for making this such a great year. I love all you guys!!! Random Tip of the day: Love your Mother: click here to access daily earth friendly calendar activities. Congrats on the upcoming Blogiversary! Congratulations on your anniversary! That is a great feat! Thanks so much for linking up! : ) AND posting about it - I really appreciate it! Can't wait to see what you do for your big blogaversary.